The San Antonio Police Officer's Association (SAPOA) hosted a fundraiser for judicial nominee Barbie Scharf-Zeldes, August 31st. Join us for a Happy Hour Reception, from 5:30-7 p.m., September 15th @ 1421 S. Alamo for judicial nominee Rosie Alvarado. September 2nd-San Antonio AFL-CIO Council Labor Day Celebration from 5:30-8:30 p.m. @ Absolutely Everything Catering, 3915 San Pedro Ave.
September 3rd-You are cordially invited to a Ramadan Iftar (Muslim special dinner), @ 7 p.m., Marian Hall Ballroom, University of the Incarnate Word. September 5th-other birthdays include: Judge Oscar Kazen, Judge Laura Salinas one year-old daughter, & local entertainer Erica Gonzaba. 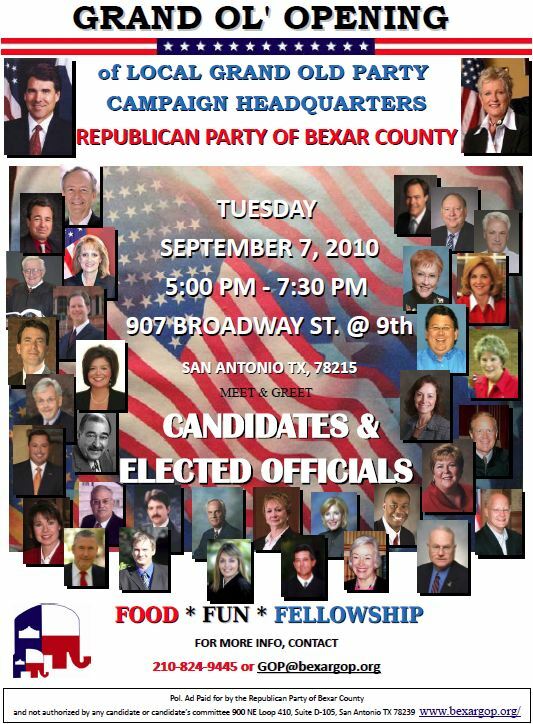 September 6th-Celebrate with Judge Laura Salinas @ VFW #76, Tenth Street from noon-4 p.m.
September 7th-Grand OL' Opening of local Republican Party of Bexar, Tuesday, September 7th at 907 Broadway from 5:30-7 p.m. Meet & Greet Elected Officials & Candidates. September 8th-Birthday of judicial nominee Richard Garcia. September 8th-National Special Guest @ United Bexar County Democrats Headquarters, 1101 Broadway from 4:30-6:30 p.m.
September 9th-Fundraiser & Reception for judicial nominee Melisa Skinner @ the home of Jo & Ramon Cervantes from 5:30 p.m.-7:30 p.m.,209 Paseo Encincal in Olmos Park. Call: 232-2252. September 15th-Happy Hour Reception for judicial nominee Rosie Alvarado from 5:30-7 p.m. @ Joe Blues, 1421 S. Alamo. September 16th-Birthday of DA nominee Nico LaHood & State Rep. Joquin Castro & Mayor Julian Castro. September 16th- from 6-9 p.m. @ Hotel Contessa, 306 W. Market St.
Join us to honor Julian & Joaquin Castro at the NSIDE September Birthday Party/Networking Event! September 16th-Meet & Greet judicial nominee Genie Wright @ 6 p.m. @ Lil Aussie Bakery & Cafe, 3610 Ave. B.
Keynote Speaker Lt. Governor David Dewhurst @ Henry B. Gonzalez Convention Center. September 18th-Birthday, judicial nominee Dinorah Diaz. September 19th-Bexar County District Clerk Margaret Montemayor invites you to a fashion show to Remember from 11;30 a.m.-3 p.m. @ the Club @ Sonterra, 902 Sonterra Blvd. Call: 496-1560. September 25th-"Magic is the Night" Black Tie Affair @ St. George Maronite Church on Babcock @ 6:30 p.m. Tickets are $100 each. 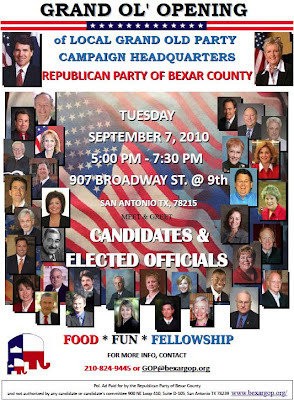 Grand OL' Opening of local Republican Party of Bexar, Tuesday, September 7th at 907 Broadway from 5:30-7 p.m. Meet & Greet Elected Officials & Candidates.